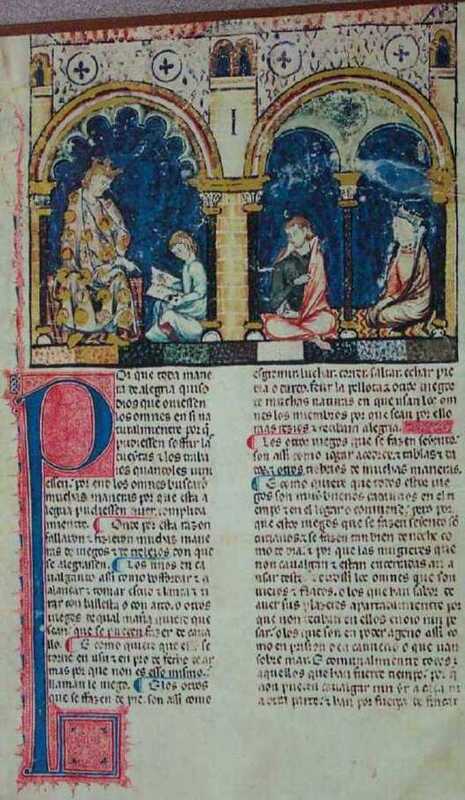 Introduction, Alphonse dictating the book, Folio 1 R.
In the introduction Alphonso expressed his belief that God intended everyone to enjoy themselves with games. "...those who like to enjoy themselves in private to avoid the annoyance and unpleasantness of public places, or those who have fallen into another's power, either in prison, or slavery, or as seafarers, and in general all those who are looking for a pleasant pastime which will bring them comfort and dispel their boredom. For that reason, I, Don Alphonso... have commanded this book to be written."